The Bundaberg North Burnett region is the southern gateway to the iconic Great Barrier Reef and Australia’s premier location for the observation of turtles. Today, you may join a tour to Lady Elliot Island or Lady Musgrave Island. Thereafter, you may wish to proceed to Mon Repos Conservation Park for a Turtle Encounters tour for a chance to watch nesting turtles or hatchlings on the beach. Accommodation: The Point Resort or similar Note Mon Repos Conservation Park Turtle Encounters tour is only available from November to March. Nesting turtles and hatchlings can be viewed from November to January and January to March respectively. Depart Bundaberg for Brisbane. If time permits, you can do some last-minute shopping at Queen Street Mall before you return your car at the airport and catch your flight home. From November through to January, it is an amazing sight to see these huge creatures heaving their way up the beach to find a safe spot to dig a nest and lay their eggs. And then, some 6-8 weeks later (generally between January to March), you can witness the tiny hatchlings emerging from their sandy nests to scurry down the beach towards the sea. Queensland Parks and Wildlife Service offer ranger guided turtle encounters throughout the Bundaberg turtle season, from November to March. Don’t miss their first moments, book now. The whale watch season in Hervey Bay is from mid July - mid October. Hervey Bay is widely regarded as the best place to watch whales in Australia as pods of magnificent Humpback whales make this their home for weeks on end. This is what makes Hervey Bay Whale Watching unique. The whales aren't just "passing through", they stop to relax and nurse their new calves in the warm sheltered waters of Platypus Bay, between Fraser Island and Hervey Bay. This makes Hervey Bay as second-to-none Whale Watching destination in Australia. A whale watch cruise in Hervey bay really is an experience of a lifetime. 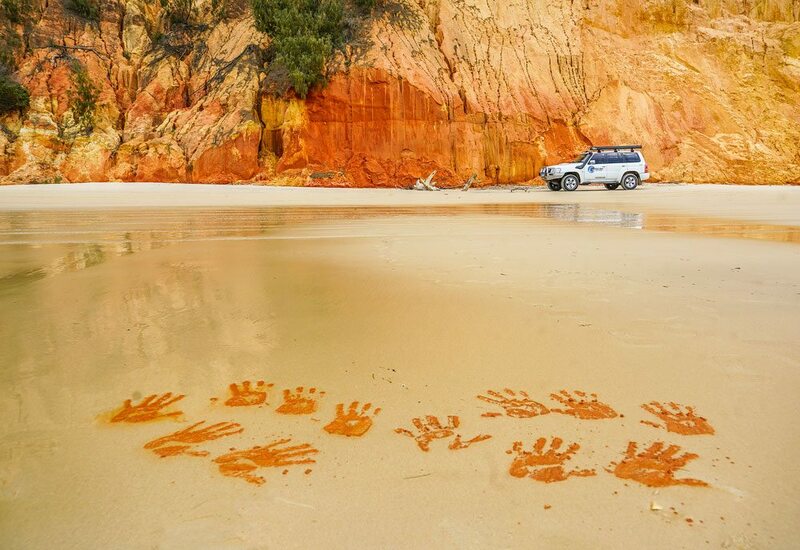 A scenic 4WD experience along the best beaches Australia has to offer. Kilometers of golden sand taking in sightings of dolphins, turtles (and whales in season July-Nov). The experienced guides will demonstrate how the aboriginals used the world famous Coloured Sands for painting and decorating boomerangs. Exclusive drive access will take you to the Lighthouse at Double Island Point for breathtaking 360 degree views across the Pacific Ocean and scenic surrounds of the Great Sandy National Park. Journey through rainforest growing in the sand dunes and experience this natural playground. All in air conditioned forward facing vehicle comfort. This tour is suited for all ages with no fitness level required.